If the warm apple and cinnamon fragrance from our kitchen found a way to fly into my laptop, on to the internet and out through whatever device you are reading this on, then I could stop writing this text right here. You would already be deep into your pantry drawers looking for the ingredients to start baking these muffins. Instead, I guess I have to convince you the old-fashioned way, with words and images. And since we truly want you to understand how thrilled we are about this recipe, we also filmed a video for our youtube channel. Let’s start with that! Apple trees heavy with fruit, small rubber boots tumbling around in the leaves, warm porridge in the morning, furry sweaters, cinnamon sticks, pitch dark nights and rainy afternoons. 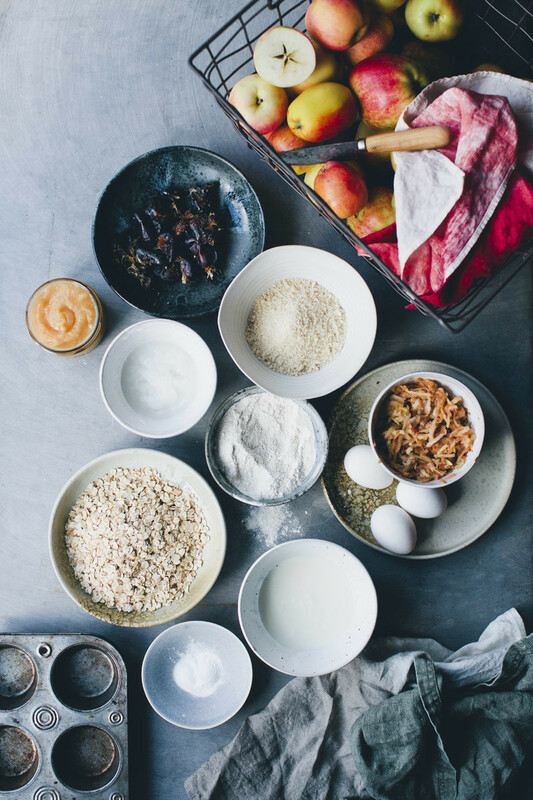 Autumn is already over us and it always seems to come with a profound desire for baking. In our apartment, switching on the oven is also a necessary trick to keep warm, since our radiators have a mind of their own. If anyone remember my previous aversion to warm apples, this recipe must be the ultimate proof that I’m passed it. 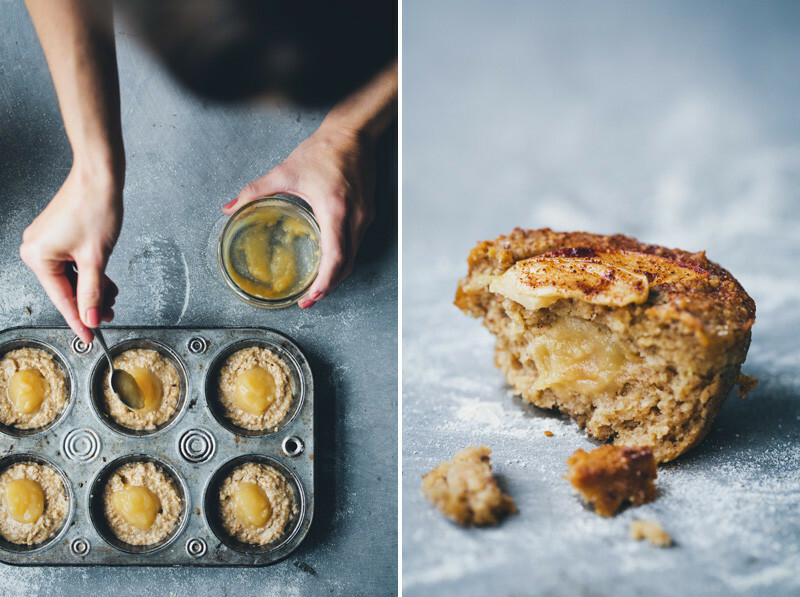 Not only does our muffins have shredded apples in the batter and sliced apples on top of them, but they also hold small golden pockets of apple sauce in the middle. It’s a serenade of apple flavours and textures paired with warm spices and they sing happy songs together. I guess this is an Autumnal edition of our Blueberry & Turmeric Breakfast Muffins. These are only sweetened with apples and dates, they are gluten-free and we have included a well-tested vegan option. The vegan version come out just slightly denser, but they taste almost identical. The combination of apple, oats, almond and buckwheat is perfect in an earthy, wholesome but still light kind of way. 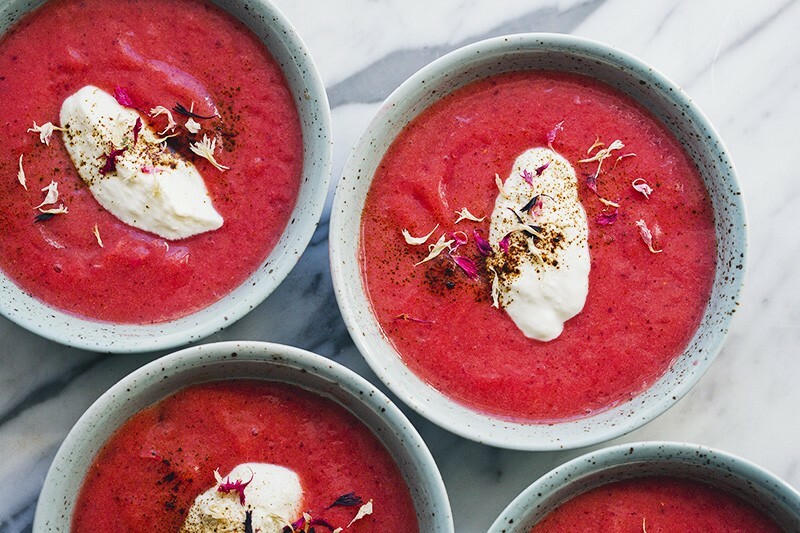 So if you are also feeling the autumn mood or are just freezing and need another excuse to switch on the oven, we have got just the right recipe for you. 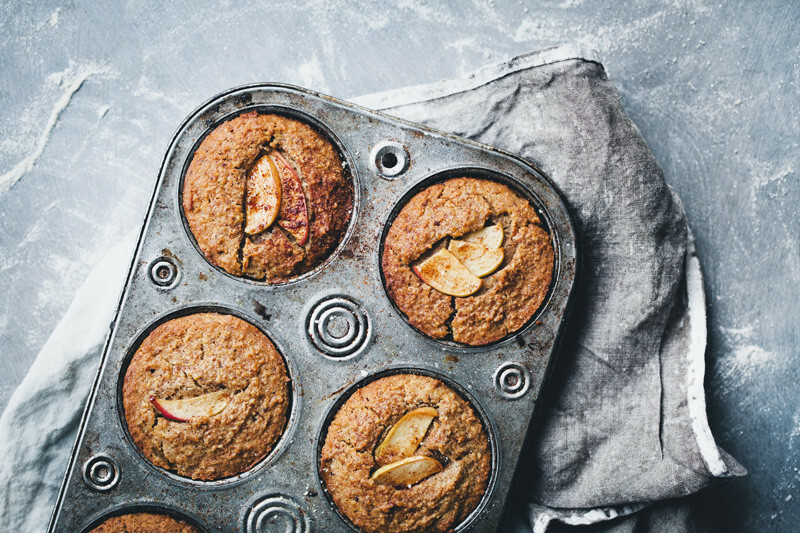 These muffins are only sweetened with apples and dates. We make our own apple sauce and even though it is unsweetened, it has a naturally sweet flavour that works perfect in this recipe. Since the muffins are not overly decadent, we enjoy them both as weekend breakfast and weekday dessert. However, if you know that you like your muffins more on the sweeter side, you can replace have of the apple sauce with maple syrup. Preheat the oven to 400°F / 200°C. Grease a muffin pan with oil or butter or line it with muffin tins. Add all the dry ingredients to a food processor or blender and process on high speed so the oats turn into coarse flour and all ingredients are mixed. Transfer to a large mixing bowl. Add eggs, yogurt, coconut oil, dates and 1/3 cup / 80 ml of the apple sauce (save the rest for later) to the food processor or blender and mix until smooth, and then transfer to the mixing bowl with the dry ingredients. Grate two of the apples and add them to the batter. Divide the batter into the muffin tins, filling them only half way up. 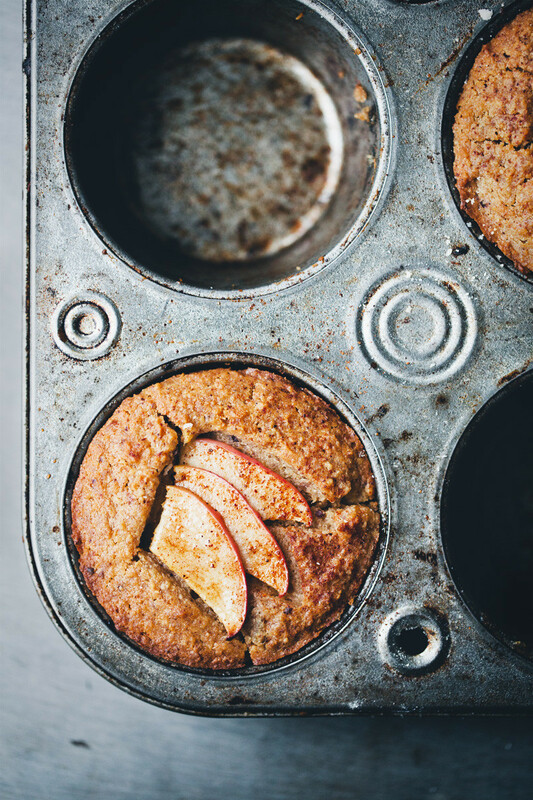 Drop a heaping teaspoon of apple sauce in the middle of each muffin and then cover with the remaining batter. Slice the last apple thinly, brush the slices with oil and place one or a few slices on top of each muffin, pressing them down slightly. Dust with cinnamon. Bake for about 18-20 minutes. Let cool for a bit before taking them out of their tins and they will release easier. Enjoy! Apple sauce is one of the simplest things to make and if you choose a sweet variety of apples, no other sweetener is needed. This makes more than you need for the Apple Muffin recipe, which is good as you can add large spoonfuls of the leftovers on top of yogurt or cultured buttermilk in the morning. Core the apples, cut them in ½ inch / 1 cm dices and add to a large sauce pan on medium heat together with the water. Bring to a boil and then turn down the heat slightly. Let simmer for 20-25 minutes. Use a hand blender to mix it smoothly. Add lemon juice and stir around to prevent the color from going brown. Store in air-tight glass jars the fridge for up to about a week or in plastic containers in the freezer for-like-ever. You guys make the BEST videos... too cute and too delicious all at once. Can't wait to make them as the turmeric breakfast muffins are already a stable here:) Btw, used your Stockholm guide last week and it was amazing (Pom&Flora <3) Thank you so much! What would be the best replacement for almond flour for a nut free option? I would love to know the same thing! I was thinking coconut flour as they seem to have a similar texture, but I have no idea if the are similar in flour qualities. I haven't tried specifically for this recipe, but usually it works fine to substitute the almond flour with 1/3 of the quantity in coconut flour, since the coconut flour absorbs more moisture than almond flour. I love to bake when it's colder, you get nice and warm and as you said, the oven works as an extra radiator. 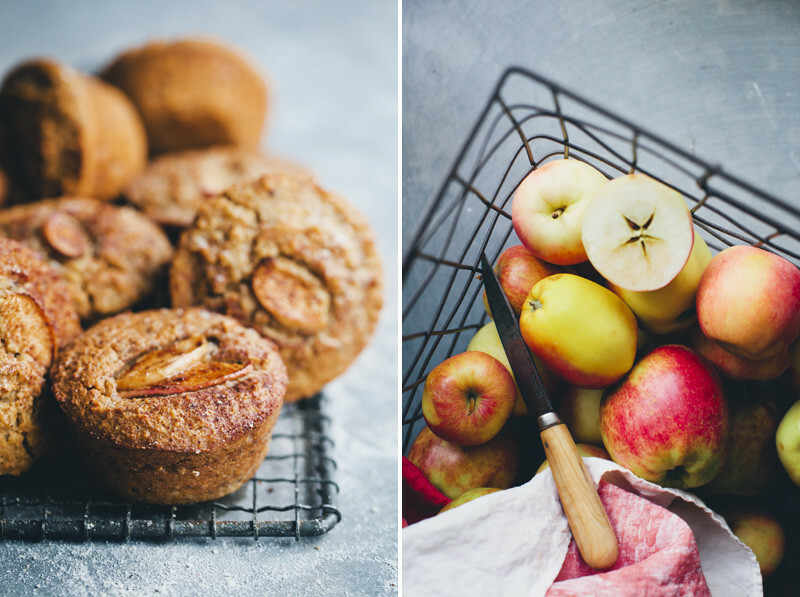 These muffins look delicious, I love that you loaded them with apples in all forms. 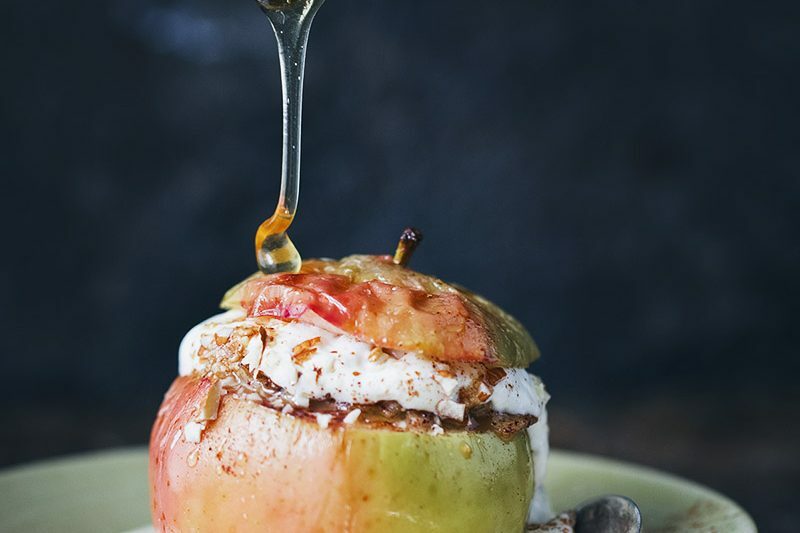 Is there any specific kind of apples that you would recommend? I can smell the cinnamon from here! Totally making these! 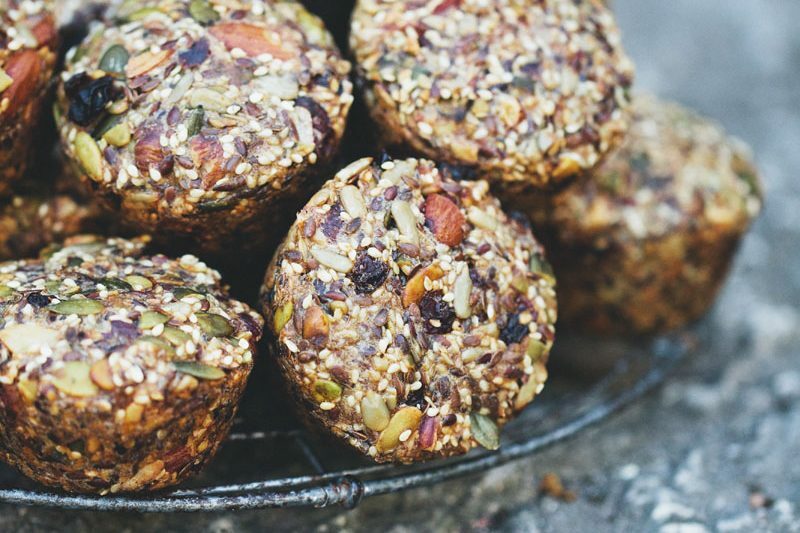 These muffins look fantastic, I can't wait to make them! What are the best kind of apples to use for the apple sauce? Is it the same kind I should use for the muffins? Could I replace dates with 2 bananas if fructose intolerant? And what could be substituted for the oats? That is super sweet video..look forward to making the recipe. Could you please let us know the music. It really goes well with the images. Oh my goodness. 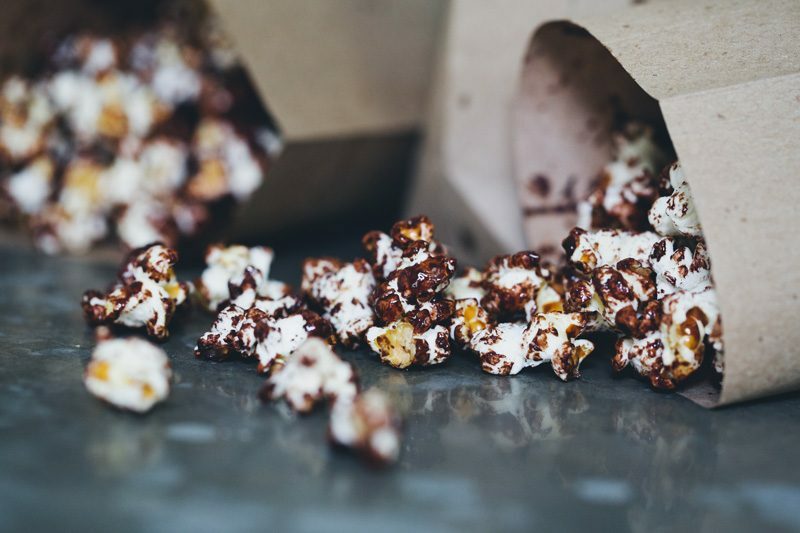 These look so good I may have to go buy the ingredients right now! What does the arrowroot do? I've never used it before.